Does your company have the time to save money? It’s no secret. There are lots of good ways for organisations to become smarter and more cost effective. We can do in depth research, read big fat instruction manuals, compare notes, experiment, test. For example, when it comes to cold chain shipping, large pharmaceutical companies are more likely to employ dedicated staff to help them investigate the safest and most cost effective shipping & packaging configurations. But smaller organisations and startups – where employees have a myriad of responsibilities – may simply be overwhelmed by cold chain shipping, and miss out on its many cost effective opportunities. Discover “Just Right” Systems and Protocols. At NV Logistics, we want to help all companies choose safer, leaner and more cost effective cold chain shipping solutions. We’ve written this article and accompanying tutorial for busy professionals like you. And if you pick up a tip or two whilst glancing through – you’ll make us very happy! Why the just right solution is not a solitary affair. Whether you work in a large company or a tiny small one, seeking a symbiotic relationship between the user and the service provider is never a romantic folly but a prelude for all optimised solutions. With cold chain shipping – as much as with any other process that implies a certain complexity and a wide selection of choices – it pays to set aside a few moments for straightforward discussions about needs and constraints. Over time, when we nourish trusting relationships, we’re able to observe how much more efficient and cost effective our shipments become. Let’s go on to the Tutorial and discover the most important elements you and your supplier will need to consider. The Tutorial – How to get cold chain shipping right. 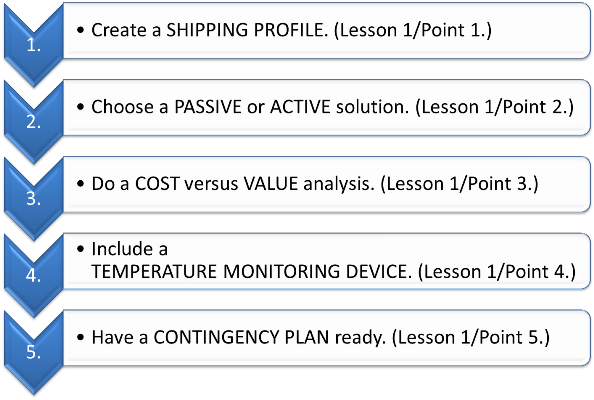 Lesson 1 – Five actionable guidelines for lean shipping. As we’ve seen in our previous series Shipping biological substances, a pre-condition to making an optimised shipping choice is Classification. Ensure you’re able to identify the needs of your shipment by its unique characteristics. The Checklist here below lists the questions you must ask before making a shipping decision. 2. Consider ACTIVE versus PASSIVE cold chain configurations. One of the key decisions you need to make is whether an active or passive shipping system is needed. In our next article Getting cold chain shipping right | Active versus Passive cold chain configurations (2/3), we compare the two systems, allowing you to get an overview of the key elements that lead to an informed decision. Suffice it to say here that passive shipping configurations are manufactured systems, in other words an insulated packaging design with poloystyrene, polyurethane or vaccuum insulated panels. Active shipping configurations are usually leased containers with advanced temperature controls that are powered by electricity and/or battery. Don’t cut corners with packaging systems. We’ve come across situations where shippers added cold packs to insulated packaging, assuming that it will keep the shipment cold. This is a gamble if the system has not been qualified under the conditions you require. Also, when you have a commodity that needs to be kept at refrigerated temperatures, it may not be appropriate to use a packaging system designed for dry ice conditions. Avoid bad outcomes by selecting packaging designs that are certified for maintining the required temperature range. Don’t over-engineer your packaging systems. Controversely, some shippers may be using packaging configurations that are too sophisticated and usually too costly for a customer’s needs. It’s not cost effective, for instance, to use a packaging system that will maintain temperature for 72 or 96 hours for shipments that are likely to be delivered within 24 hours. Also, using a large active shipping configuration when a passive system is sufficient, leads to unnecessary costs. For example, you pay a lot of empty payload space if you can’t maximise the unit’s capacity. 3. DO cost versus value analysis for each shipment. If your current company policy determines that it’s simpler to have one single packaging configuration for global shipments, we recommend that you do your company favour by challenging the underlying assumptions that lead to this company policy. As a first step, share the five actionable guidelines we present in this Lesson 1 with other decision makers in your organisation. 4. Temperature Monitoring Devices – Make technology your ally. Regardless of the packaging system chosen, it is highly recommended that you employ some sort of temperature monitoring device. Advancements in device monitoring technology provide a variety of options that address the number 1 concern of most users: product temperature deviation. The TPL Insight Magazine report we quoted earlier tells us that Reducing or preventing product deviations or excursions is the top priority for 69% of cold chain clients. go often astray! We don’t really need John Steinbeck* to tell us that, because each of us has at least one story to tell about the fickleness of planning. The Contingency Plan is critical! Even with the best systems and monitoring technology in place, an unplanned delay or rerouting could potentially jeopardize the stability of a shipment. A Contingency Plan specifies, for example, whether to keep packaging cold or frozen in refrigerated rooms or freezers, or whether to replenish the packaging system. Contingencies must also include the recipients of the shipment, determining if after hours delivery is an option and if proper personnel are on site to accept an after hour’s delivery. Keeping the lines of communication alive at all times will ultimately avoid misunderstandings, confusion and loss of precious substances! When you organise an urgent shipment and are about to call your logistics supplier, internal or external, make sure to check and discuss (at least) these 5 imperatives. About the “Getting cold chain shipping right” tutorials. We’ve prepared 3 Lessons, spanning over 3 separate articles. In this Lesson 1 – Setting the scene for best value (1/3) – we talk about actionable guidelines for lean shipping. In Lesson 2 – Active and Passive shipping solutions (2/3) – you’ll discover more about active versus passive cold chain configurations. 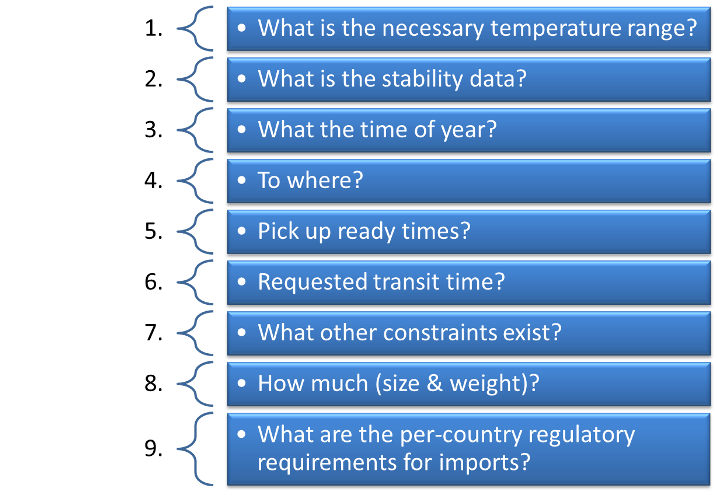 Lesson 3 – Smart Cold Chain Shipping. A case study (3/3) – presents a concrete example which unveils the process we use at NV Logistics to achieve optimal cold chain configurations. Whilst we strive to make our articles and tutorials as accurate as possible, NV Logistics SA cannot be held responsible for any changes in rules & regulations initiated by various worldwide organisations, including governments and others.